Just a little more than a year since Starbucks first unleashed the Unicorn Frappuccino, the coffee slinger recently said it's significantly cutting down on its wild, limited-edition drinks. Now, the company appears to be putting this change into practice on Tuesday with the launch of two new, but decidedly normal Frappuccinos on its permanent menu. 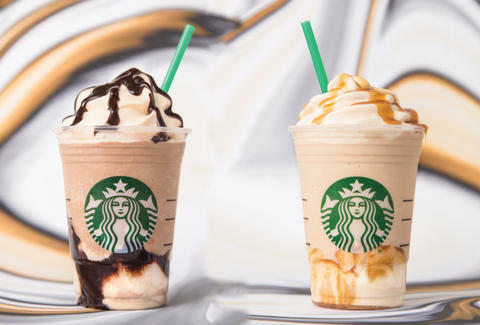 In fact, the two new blended beverages -- the Ultra Caramel Frappuccino and the Triple Mocha Frappuccino -- are more less just upgrades to Starbucks' classic Caramel Frappuccino and Mocha Frappuccino, respectively. As their names suggest, the "Ultra" and "Triple" versions take the drinks to "the next level" with "extra texture, beautiful layers, and tons of flavor," according to a company spokesperson. They officially land on Starbucks menus in the United States and Canada on May 1. Starbucks said the Ultra Caramel Frappuccino is made by layering dark caramel sauce and whipped cream in a dark caramel-flavored coffee Frappuccino. Meanwhile, the Triple Mocha Frappuccino sports ribbons of dark mocha sauce and whipped cream layered into a mocha-flavored Frappuccino. Both of the Frappuccinos are made with Starbucks' all-new Sweet Cold Brew Whipped Cream for additional coffee flavor. In other words, the drinks are subtly different -- and potentially better, depending on your tastes -- compared to their predecessors. The new drinks arrive just days after Starbucks executives told investors the chain plans to reduce the number of limited-time drinks by about 30%. Your Instagram feed will likely never be the same... and probably in a good way. If you're looking to get your hands on the new Frapps, it looks like you may want to wait 'til Thursday, May 3. For one day only, Starbucks is offering 50% off any grande or venti Frappuccino after 3pm if you've signed up for the chain's offers. What better way to celebrate the total demise of Unicorn Frappuccino-like drinks? Tony Merevick is Senior News Editor at Thrillist and thinks this "dark caramel" stuff sounds intriguing. Send news tips to news@thrillist.com and follow him on Twitter @tonymerevick.